Congratulations Caroline on the publication of your recent Technology innovation paper. It gives us a way to approach innovation in a structured way by capturing expertise an finding opportunities in a programmed way. Published online: 07 Feb 2014. Technology innovation plays a vital role in elite sport, yet often proceeds in an ad hoc manner, emerging from the grass roots of sport rather than as a strategic programmed activity. 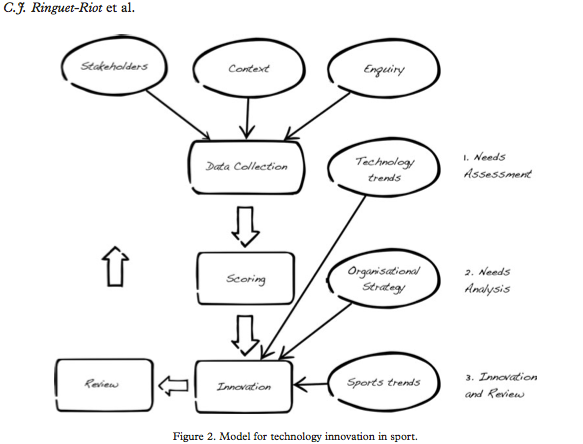 This paper presents a model for systematic technology innovation in sport. It was developed from an extensive review of innovation and management best practice from the literature and draws on successful examples of innovation in sport. The model uses needs assessment, context and stakeholder theory, together with structured enquiry, to establish technological literacy and identify translational and technology-ready opportunities to meet existing and emerging needs. It consolidates existing knowledge, translates exemplars of innovation from sport and other settings and highlights process innovation as being a vital element in the achievement of innovation. The model is then applied to a professional sports organization demonstrating its utility as an organizational tool for planning for innovation and highlighting areas of best practice. Identification of near and mid-term opportunities for innovation was a key outcome.